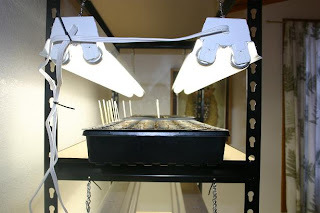 We built (what I am calling) a germination and propagation station today. This transformed one of our spare bedrooms into a functional room as opposed to a large, empty closet! 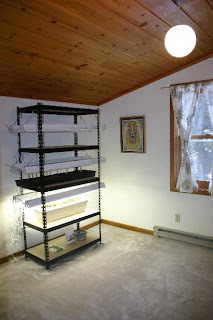 It's actually perfect for germination and growing seedlings as this room has it's own thermostat and the plants can be protected from our dogs. It's also nice that no neighbors can see the light on in this room. When we had florescent lights in the solarium to compensate for short winter days I think our house probably looked a bit fishy from the outside. I can just imagine the neighbors wondering: hmmm.. what are those two hippie types growing up there? We didn't manage to get the sizing perfect as shelving units are sold in 3 ft widths and florescent lights are cheapest in 4 ft widths. However, we can expand this shelving if we need to at some point. 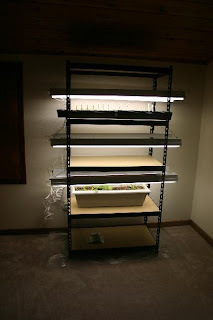 All together, this was $230 for all of the light fixtures, the shelving, a power strip, timer for the lights, seed starter mix, trays and labels. And all purchased with a generous wedding gift from my mother-in-law. We'll be able to comfortably get 9 trays of seedlings in there. Once plants get going in here, we can transfer them to the solarium, the greenhouse or out into beds depending on the temperature. Just wait until next week (or the week after) and hopefully there will be some green dominating the scene. Until then, the lights will take a break and we'll heat the room up a bit. I have some seeds growing on a window sill, but some I will be growing under lights also. Very nice, we were just setting ours up yesterday. Mr. H, I'm happy to know that you're getting your seeds going right now as well. It was hard for me to even wait this long!